As planes got bigger, gates had to be farther apart. With more retail space, we needed extra concourses. Meanwhile, moving walkways disappeared in Newark, Chicago, and Orlando. They were replaced by bars, restaurants, and seats. 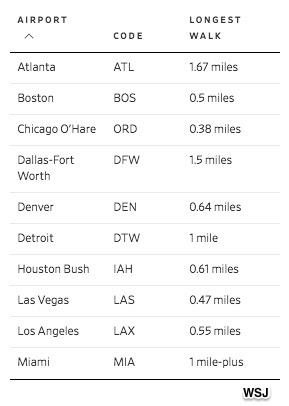 Walking distance is one of many criteria on which an airport can be rated. Where are we going? To airport competition. “Would you care for dinner?” the flight attendant asks. “What are the choices?” the passenger asks. “Yes and no,” the flight attendant replies. Long ago, we got pretty dismal free meal service on planes. Now that there is none in coach, we buy our food at the terminal. Consequently, food purchases at airports soared. And we started to care about the snacks and meals they sold. Called “shopping malls with gates,” airport retail has a captive audience. In duty-free stores, world travelers pick up some chocolate, cosmetics, and alcohol. The customer gets a good price, the airport gets a slice of the revenue, and luxury goods sellers can grab some impulsive traffic. Since domestic travelers can do the same shopping, we might call duty-free, tax free. After Dallas-Fort Worth opened its Walgreen-size duty-free area, it equaled other international retail destinations. Management said its venue felt like London or Beijing. They had more high-end options that business people and affluent vacationers could appreciate. They even offered cognac tastings from Moët Hennessy. 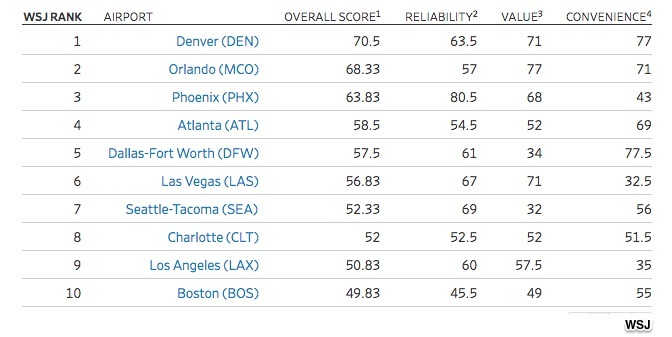 When WSJ rated the largest U.S. airports, it used 14 variables. In addition to the walking, food, and shops, they included WiFi quality and security delays. Average fares, nonstop destinations, and the largest airline’s dominance also counted. Although an airport appears to be a monopoly, it does have competition. Airports compete because airlines and domestic and international travelers have more destination options. Like Apple and other oligopolies, those airports have pricing power. But also like other big businesses with few competitors, they need to establish product differentiation. And you know how they do it. They have their stores and food and WiFi. However, the long walks might be a problem. My sources and more: Yesterday’s WSJ had several excellent articles on airport competition and ranking while in the past, they looked at airport retailers and walks. Then for some history, I went to a 2001 NY Times article on airline food.